Chop 8 eggs for the tuna salad. Slice the remaining 25 eggs into quarters. Drain and flake tuna in large mixing bowl. Combine tuna, celery, onions, pickle relish, dry mustard, mayonnaise and eggs. Mix lightly until well blended. Cover and place in refrigerator until ready to use. Wash and drain cucumbers and tomatoes. Slice cucumbers ¼ inch thick. Combine prewashed salad greens together and fill salad tray with 2 cups of mixed greens. Place 6 cherry tomato halves or 6 grape tomatoes around chicken salad mixture. In front right corner, place 3 slices of cucumber. Place 2 egg quarters in bottom left corners. In top corner, place cluster of grapes (¼ cup) or other fresh fruit. Close container and refrigerate. Portion one tuna salad salad per serving. Each portion provides 2 ½ oz. eq. of meat/meat alternate, ¼ cup fruit, ½ cup dark green vegetable, ¼ cup red/orange vegetable, and 5/8 cup other vegetable. If fruit other than grapes are used in this recipe, nutrient analysis will need to be re-calculated. Crackers or other grain may be offered with salad, but should be menued as another item because crackers are not included in the recipe or in the nutrient analysis. Presentation Idea: A container allowing space for the salad, fruit and dressing is recommended. Clear plastic lid for eye appeal is preferable. 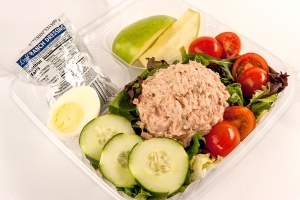 1 serving of Tuna Salad Salad.